It was definitely a " Chamber of Commerce" weekend as far as the weather and surf conditions were concerned and the catch list was impressive. Pompano, whiting, croaker, jacks, Spanish mackerel, bluefish, blue runners, and bonefish were all taken from local beaches. Saturday proved to be the slowest day of the holiday weekend but there was still a lot of rod bending. My son Dan ,daughter in law Erin and grandkids, Christian and Emmy are here for the week and they all took turns reeling in plenty of fish. We got a little bit of a late start on Saturday but the late morning produced a couple of keeper pompano, whiting, croakers, and even a bonefish. We fished at Stuart Beach where the water was super clean and very calm. EZ Flea Fishbites and sandfleas were our baits of choice. Christian nailed both keeper pompano on one rig and got his first doubleheader. My granddaughter Emmy and daughter in law Erin teamed up to land their first bonefish also using a piece of EZ Flea Fishbites. Easter Sunday we decided to head north and try a couple of beaches to the north and ended up at Blue Heron. The bite definitely picked up as we put 9 nice pompano and a whole bunch of big whiting in the cooler. 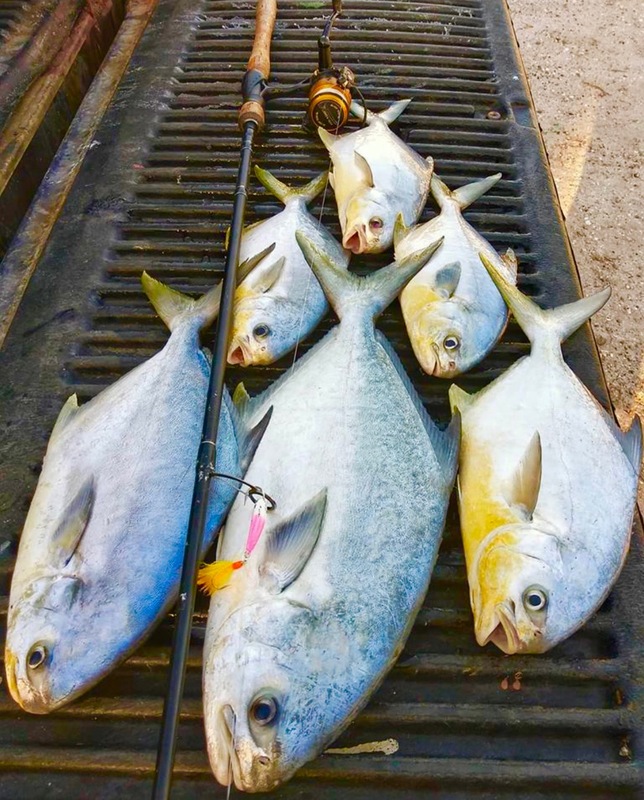 Reports from Middle Cove and a couple of beaches by Fort Pierce Inlet told of a good pompano bite, especially in the afternoon. 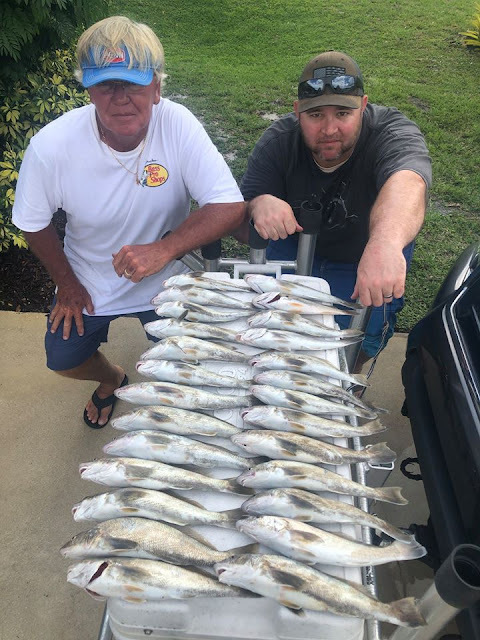 Today, Monday, was even better as the grandkids took a day off so I fished by myself in the morning and was lucky enough to end up with 20 nice pompano and a cooler of big whiting . EZ Flea,Pink Shrimp, and yellow Crab Fishbites along with frozen sandfleas were the ticket today. I talked to a couple of friends who fished at Middle Cove today and they also experienced a good pompano and whiting bite. Light East winds are forecast all week so look for this great fishing to continue. Look for good water color and make sure you have the right equipment to reach the pompano if they are your targeted species. The late morning and early afternoon high tides this week should make for a good afternoon bite as long as the weather that we are experiencing stays around. 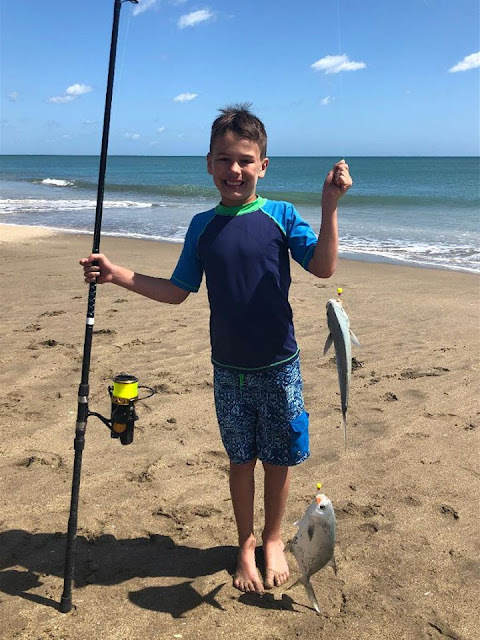 Along the beaches around Jensen Beach, they are still catching some nice size pompano and plenty of whiting and croaker along with a few snook. In the St. Lucie and Indian Rivers snook bite is beginning to get good. 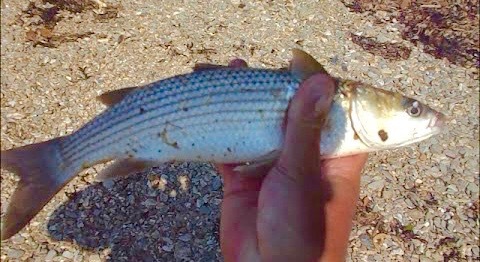 Anglers working the docks and bridges using live bait (mostly pilchards with a few threadfins) are having a blast. They are also landing a few nice trout as bycatch. If you’re looking for a rod-bending fight there have also been some big jack crevalle in the area. A steady supply of pilchards can be found at Stuart Live Bait in Manatee Pocket. At the Boynton Inlet, sheepshead and croaker have been hitting crabs and cut shrimp off the north jetty during the day. At night, snook over 40 inches are being caught using live mullet or croaker fished on the bottom and two- to four-ounce jigs (either Flarehawks or white chicken feathers) bounced off the bottom. In the Intracoastal, on the flats north of the inlet and the docks along Hypoluxo and Manalapan, there has been decent action on bonefish, snook, jack crevalle, ladyfish, mangrove snapper, moonfish and redfish. Best bets have been live shrimp on eighth-ounce jig heads, bouncing three eighths-ounce yellow butterbean bucktail jigs off the bottom during the day and using epoxy glass minnow flies on five- to eight-weight fly rods at night. Lantana Bridge anglers have been catching ladyfish and Spanish mackerel using live shrimp and glass minnows. The bass bite is still excellent! They are being caught on shiners as well as artificial baits including swim jigs and spinner baits working the outside grasslines. Hot spots have been Kings Bar, Third Point and the Buckhead Ridge area. The spec bite is pretty much over, but the bluegill bite has been coming on strong. Though it’s still a month away before they begin bedding down, they are being caught on worms and crickets in the Kissimmee River. The lake level is low so boaters be careful.
" Threes a charm" is not the phrase that most folks that target pompano use when it comes to a location that has been producing great pompano fishing. . The rule that I was taught by a local friend and commercial pompano guru was that one day at a spot- great, two days-fantastic, three days , go buy a lottery ticket because that's unbelievable. After two great days of pompano fishing, today they were pretty much gone. My sons Paul Jr and Randy , my daughter in law Jennifer , and friend Chuck Frith got into an all day bite at Stuart yesterday. Chuck got his recreational limit in short time and headed home early. Another friend and local surf fisherman, Ron Robinson from Stuart, caught his limit in 45 minutes and called it a morning. My group each got their 6 fish and after they filled up the cooler I stayed and was lucky enough to fill a couple more coolers..I continued to fish and yesterday turned out to be the biggest day I have had since getting my commercial license. This is the type of action you can find during the spring when a large school stays in one area for a couple of days. As far as today was concerned , the bite shut off and I only caught two before I called it a day. The real challenge today was finding a spot on the beach to set up as fishermen were spread from Tiger Shores to the south end of Stuart Beach. EZ Flea Fishbites continues to be the hot bait along with frozen sandfleas. Other species that were present were blue runners, Spanish mackerel, jacks, ladyfish, bluefish, and a few bonefish. 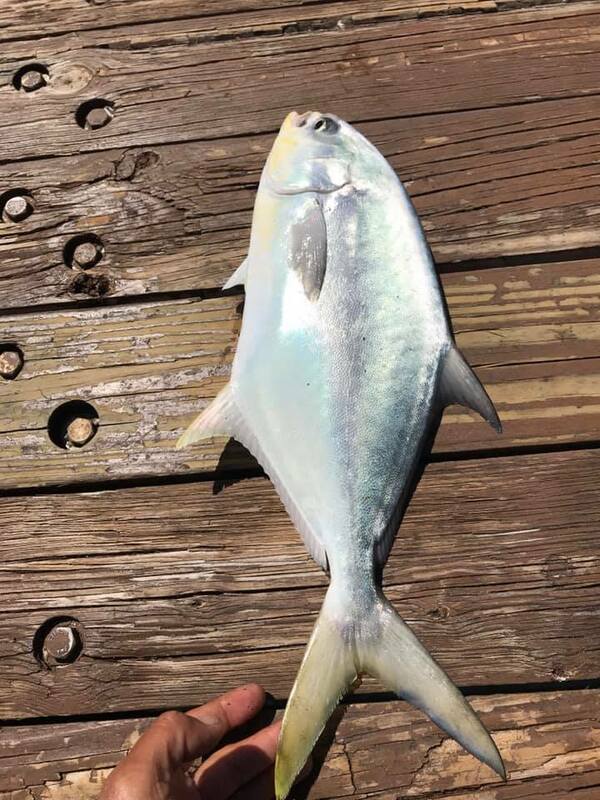 These pompano are constantly on the move so check conditions at some of your favorite beach accesses and if the water is that nice "clean green or powder blue ", throw your baits out and I hope you are lucky enough to find a few. 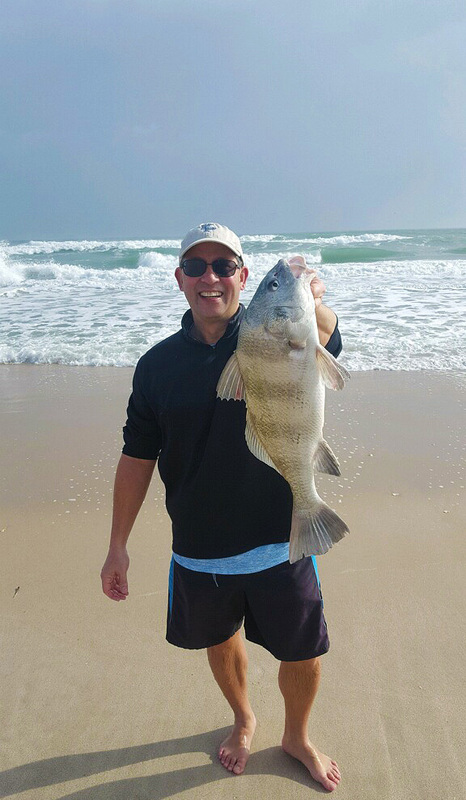 The spring surf fishing is showing signs of a great bite but surf conditions continue to be challenging up and down our beaches with weeds and off colored water keeping the catch rate down. Pompano, whiting, croaker, blue runners, and jacks are all bending rods on the days when the above conditions are not present. I started at Bathtub Beach on Monday morning and caught four nice pompano very quickly before the ever present weeds showed and made fishing impossible. EZ Flea, Orange Clam, and Pink Shrimp Fishbites , along with some clam strips produced the bites. I headed to Bridge Road Beach access in Hobe Sound in the afternoon and found the water not as clean but no weeds. If the water is slightly discolored and a bit streaky with some brown and green tint, try that area because the water could actually be cleaner on the bottom at that spot. That condition has been prevalent in Hobe Sound because of the beach replenishment activity that has been ongoing on Jupiter Island. The dredge pumping the sand in from offshore will create a cloudy and streaky effect along the shore line but the area where you are casting to at 70 to 100 yards off of the beach will have clean water on the bottom. I was lucky enough to put a dozen nice pompano and some big croaker in the cooler from 4 to 6 pm at the Public Beach access. EZ Flea was the hot bait for that afternoon bite. The swell was starting to build yesterday afternoon when I took a look at Tiger Shores, Stuart, and Santa Lucea and there were some weeds present . The forecast has conditions improving for the weekend so find the beach with decent water and no weeds and you will catch some fish. In Jensen Beach, the pompano fishing has been good, but its all been about finding the right water. Fishbites, clams and sandfleas have been working. In the St. Lucie River, the snook fishing is getting better and better, but there have been quite a few small fish. Anglers working the bridges at night are catching the bigger ones. Flare Hawks and Spooltek lures are working well. Along the beaches in Jupiter, the pompano fishing has been excellent! They are making their migration north and if you want to catch them this is the time. Clams, sandfleas and pompano rigs with Fishbites are working well. The best conditions along the beaches are a light southeast with surf that is not too rough. At the Jupiter Inlet, anglers are catching Spanish mackerel and with the warming water, the snook are beginning to show up. From the beaches of Lantana south to Delray, surf anglers have reported catching of Spanish mackerel, jack crevalle, bluefish and pompano. Gotcha Lures, Goofy jigs and Diamond Jigs have been the lures of choice. At the Boynton Inlet, anglers have been catching snook, permit, mangrove snapper, ladyfish, jack crevalle, bluefish and croaker off the jetties. Early morning and night has been the times to fish live shrimp, crab, cut mullet or live pinfish. Big jack crevalle up to 35 pounds have been crushing top water poppers worked along the seawalls and mangrove roots from Woolbright Bridge up to Lake Worth. Lantana Bridge anglers using live shrimp, cut mullet, live mullet and small crabs have been landing sand perch, sheepshead, black drum, snook, ladyfish, bluefish, jack crevalle and croaker. 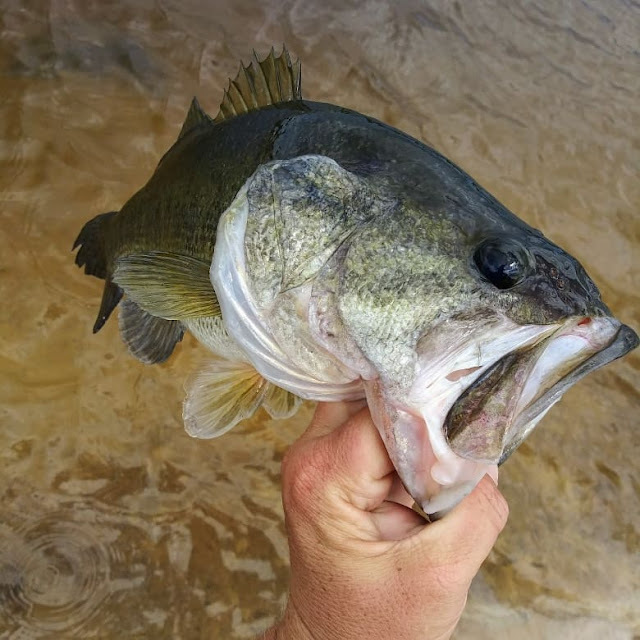 Though the wind was howling yesterday and made fishing a bit difficult, the bass bite has been fantastic recently. Working the outside grasslines, the shiner bite has been good and for artificial swim baits and Gambler Aces have been working well. The lake level is very low right now so be careful. Fishing was great this weekend at Sebastian Inlet and there was a lot of action we’re told. Bluefish and Snook are biting off the North Jetty. Use Got-cha lures and silver spoons for best results. Our friend Tommy at Sebastian Inlet Bait & Tackle has been seeing some big Reds, Spanish Mackerel, Black Drum, Sheepshead and Flounder too. Try for the Flounder and Sheepshead west of the bridge in the channel. Rubber-tailed jigs have been working well for the Flounder and Sheepshead are biting on live shrimp and sandfleas. Our thanks to Ed Nunez, our featured angler of the week for sending in this picture of a Black Drum he caught by the North Jetty on a trip to the inlet!